A friend recently mentioned how one crafty bartender had treated her to his bitter variation of the Last Word, swapping Angostura for gin in the traditional recipe. I had to give it a try, and found it biting and aggressive in the nicest way, so I figure it’s worth passing along. 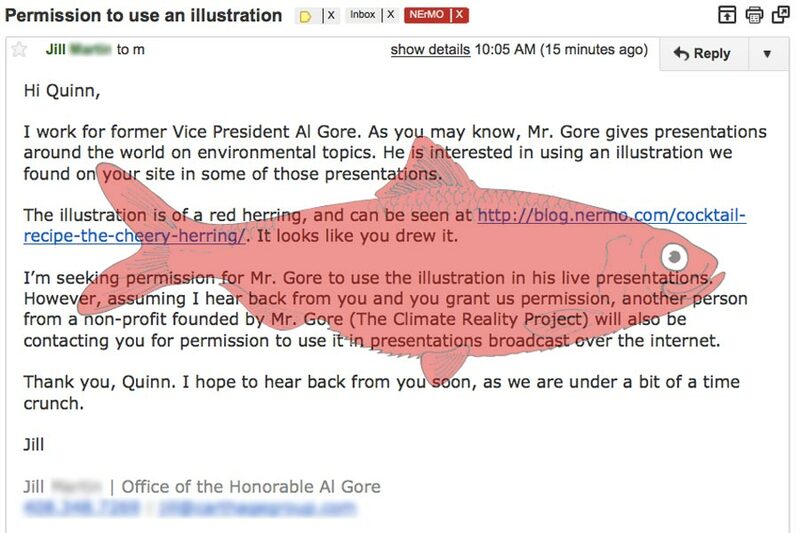 I had forgotten all about this recipe, which I posted on nermo.com before I wrote (or knew) much about cocktails, until I got an email today from a gal at Al Gore’s office asking if he could use my red herring Illustration in some of his presentations on the environment. Permission granted and recipe reposted. 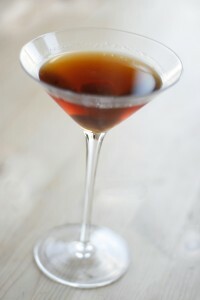 The featured ingredient in this cocktail is Cherry Heering, hence the name. Heering is a smooth and not-too-sweet liqueur; the original cherry brandy as developed by Dane Peter Heering in 1818. I was just going to call it Happy Fish, but I wasn’t sure that would be enough info to get the joke, so now I am over-explaining it. Meh, I can’t win. 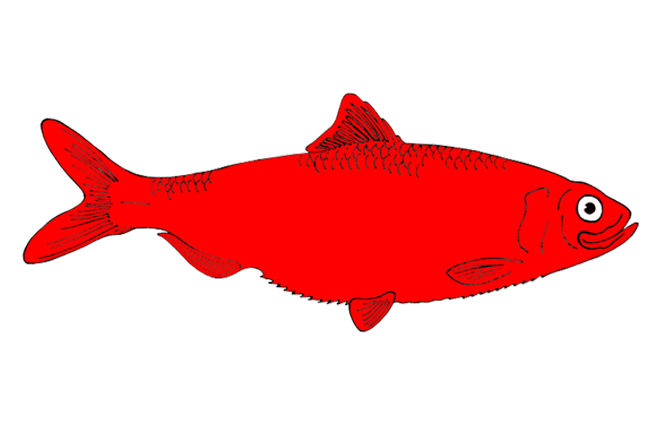 Note: Swedish fish candies are made to resemble herring and a red herring (like this one I drew) refers to irrelevant information given to distract someone from the main issue, rooted in an old superstition that when travelling, one could keep predators off one’s trail by dragging a red herring back and forth across the path. 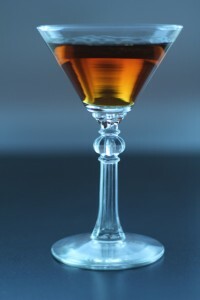 The Bijou is a strong, herbaceous and decadent cocktail, which gets its name from the french word for jewel. It’s great to batch for your Bastille Day soiree, because all of the ingredients are shelf stable, so all you need to do at party time is measure three ounces over ice, stir and strain, or make them three-at-a-time with a 1-cup ladle. No garnish; that would be totally bourgeois… or would it be gauche? A year ago, TSB and I ordered a crate of green walnuts to make nocino and vin de noix. A couple weeks ago, we finally strained the stuff and rebottled. While the vin de noix wasn’t thrilling, the nocino is a treat! 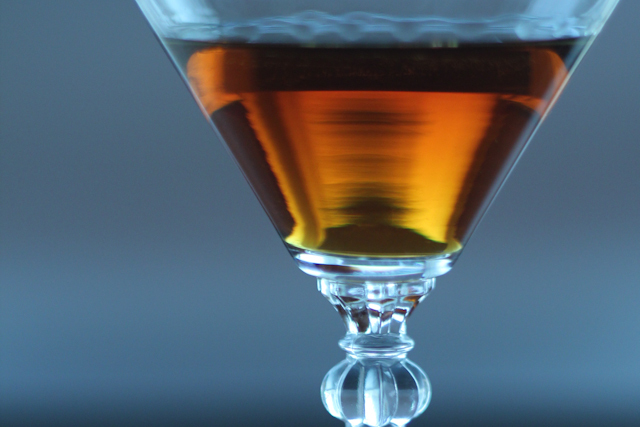 You can do a little shot as a digestif, but we liked it better as a mixer, swapping out a quarter of the rye and a quarter of the vermouth in a traditional Manhattan recipe. We noted a slight coconut aftertaste, that doesn’t exist in any of the constituent parts alone, which made for a fun surprise. Stir all ingredients with ice and strain into a cocktail glass. Garnish with a cherry. 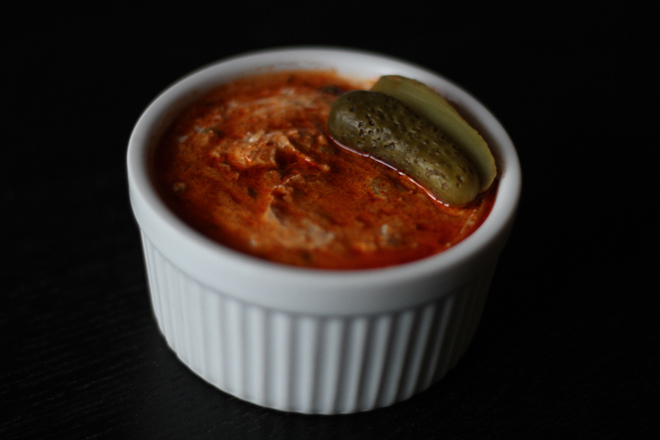 I won’t get into it more than that, because I have surely horrified you, but one of my favorite bar snacks from when I lived in Austria, which will certainly be on the menu, is Liptauer, a zesty cheese spread that’s easy to make in advance, and can be served simply with beer, wine or cocktails. 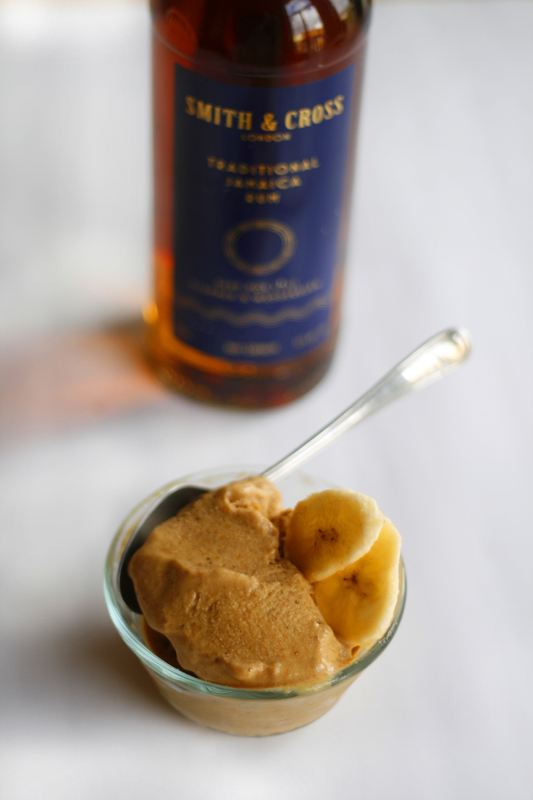 My intern wanted to use my ice cream maker before she moved to LA, so we made a batch of banana vice cream with brown sugar and Smith and Cross aged rum. It is spectacular! Slice the bananas into 1/2-inch pieces, toss with brown sugar, and top with rum in a buttered 2-quart baking dish and bake 30 minutes, stirring once. Keep an eye out for burning sugar, which leaves a bitter flavor. 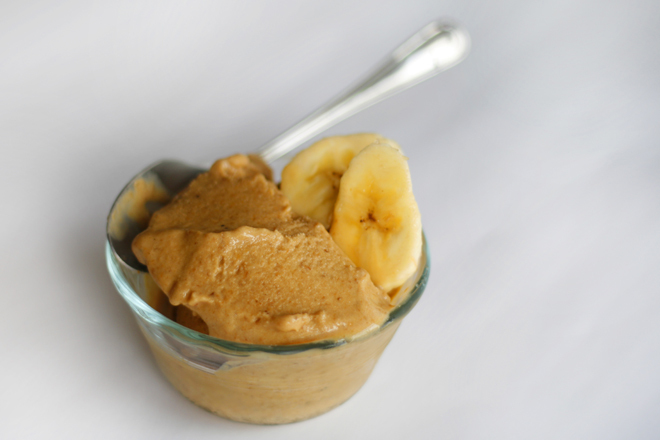 Scrape the bananas and thick syrup from the dish into a food processor. Add milk, vanilla, lemon juice and salt. Puree until smooth. I’m setting out to divine my own recipes for cocktail bitters, so the first logical step was to start with a standard, traditional recipe before branching out to make my own magical concoctions. I have plans for a batch of smoked lemon bitters, and maybe some barrel aged banana bitters for tropical tiki drinks, so to ensure that I understand the process and proportions, I started by making a batch of Regan’s Orange Bitters. 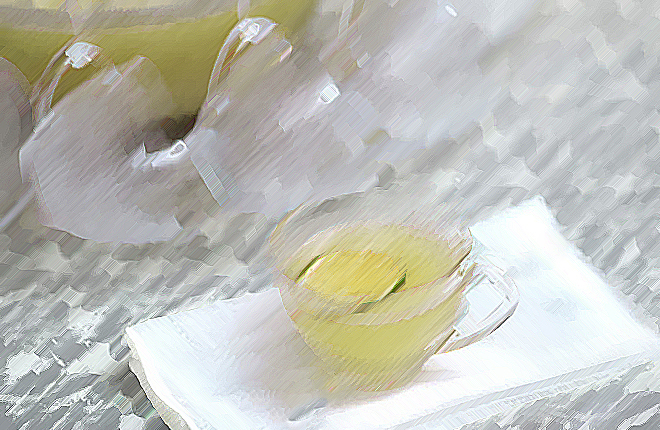 Here’s a pictorial procedural of the month-long process, with a recipe adapted from Ardent Spirits. 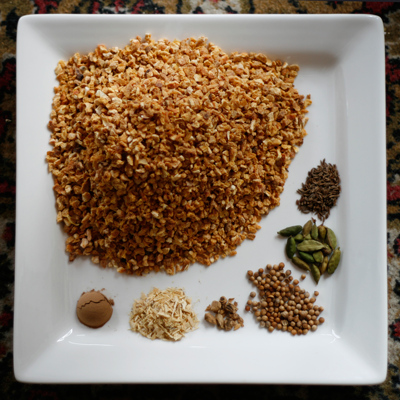 Day 1: Place 8 ounces dried orange peel, 1 teaspoon cardamom seeds, 1/2 teaspoon caraway seeds, 1 teaspoon coriander seeds, 1 teaspoon quassia chips, 1/2 teaspoon powdered cinchona bark, 1/4 teaspoon gentian, 2 cups grain alcohol and 1/2 cup water into a half-gallon mason jar, push the ingredients down so that they are covered by the alcohol and water. Seal the jar. Days 2-14: Shake the jar vigorously once daily. Day 15: Strain alcohol from dry ingredients through a cheesecloth and squeeze to extract as much alcohol as possible. Store the alcohol in a clean mason jar and seal tightly. 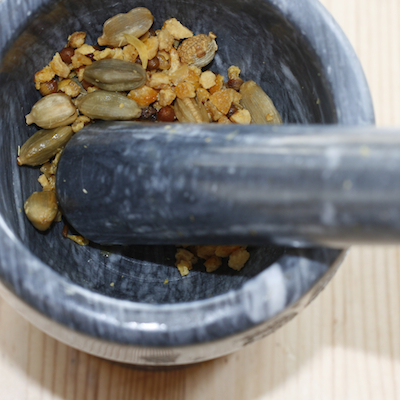 Muddle in a mortar and pestle until the seeds are broken. Place dry ingredients in a saucepan and cover with 3 1/2 cups water. Bring to a boil over a medium-high heat, cover, turn down heat and simmer for 10 minutes. Allow to cool, still covered (about 1 hour). 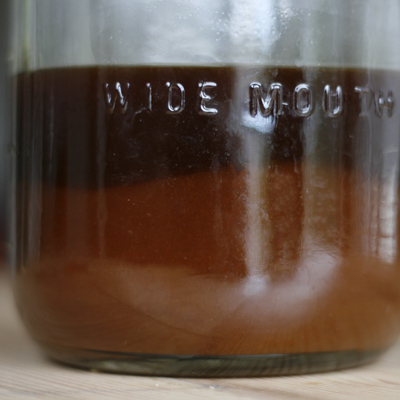 Place dry ingredients and water into the original mason jar that contained the alcohol and seal. Days 15-21: Shake the jar vigorously once daily. Day 22: Strain the water from the dry ingredients through a cheesecloth. Discard the dry ingredients and add the water to the alcohol. Put 1 cup granulated sugar into a small, non-stick saucepan and place over a medium-high heat. 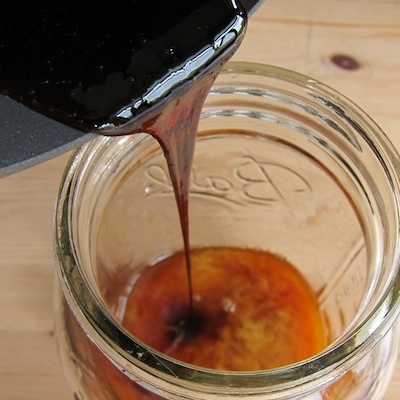 Stir constantly until the sugar becomes liquid and turns dark brown. Remove from heat and allow to cool for two minutes. Pour the sugar into the alcohol/water mixture. At this point the sugar may solidify, but will quickly dissolve. Days 22- 28: Allow the mixture to stand seven days. Day 29: Pour off the non-cloudy liquid, leaving any sediment resting on the bottom. 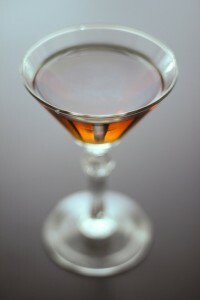 Measure the bitters (there should be about 12 fluid ounces), add ½ that amount of water, and shake thoroughly. 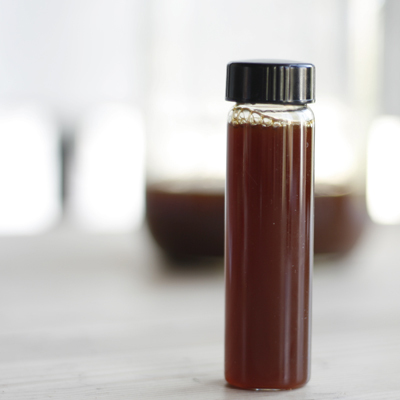 Pour the finished bitters into a bitters bottle. The florescent pink orbs you find in jars at the supermarket are an affront to the proper cocktail. Rather than buying “maraschino cherries” from your grocer, buy firm, fresh cherries when they are in season, or a bag of dried bing cherries if you are too late, and then soak them in booze. 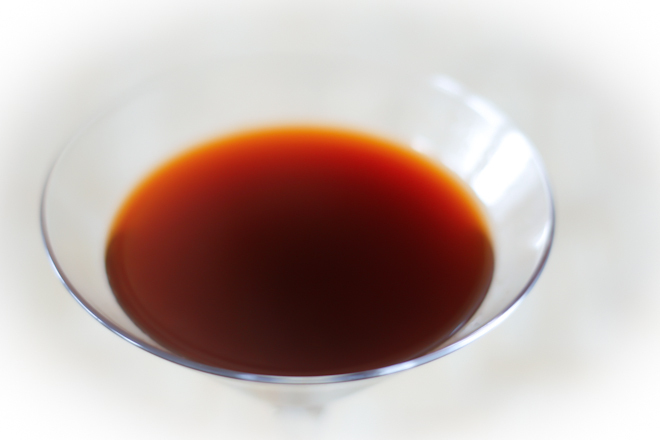 Maraschino liqueur works like a charm, but it’s expensive. 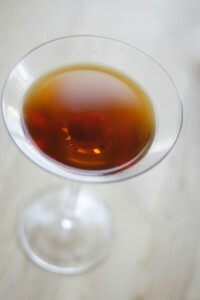 You can also use a 4:1 blend of bourbon and honey or the remnants of a bottle of port. If you want to go crazy, you could use clear creme de cacao for chocolatey cherries. 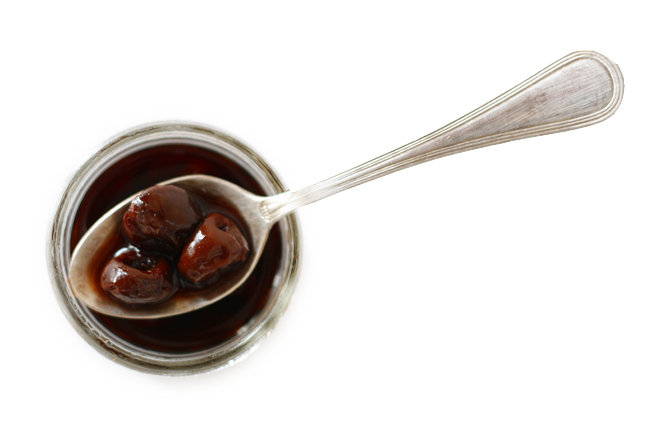 Dried cherries can be stored in a jar or bottle of booze indefinitely, and fresh cherries in booze can be jarred and preserved with proper canning techniques. There is no real recipe here because you don’t need one. This is a really hard project to screw up. Fresh fruit and herbs are the best drink ingredients, but growing seasons can be short, while cocktail cravings last year-round, so the best compromise is to preserve fresh produce for later use. This approach also works if you have a surplus of fruit and want to use it over the next month or so, except that it would sooner pass from ripe to rotten. 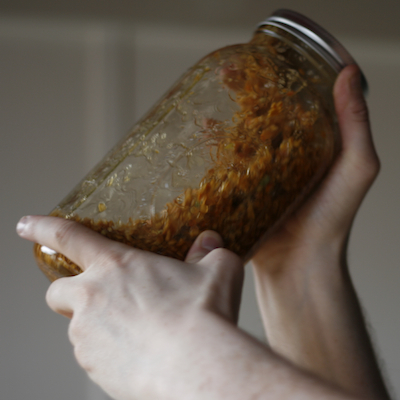 One of my favorite fleeting cocktail components is the kumquat, which I only see a week each year, so I developed this recipe to preserve them in a mixing-ready marmalade which balances the tartness to make a great sweetener. I’ll post a marmalade cocktail recipe next week. Pulse kumquats in food processor until finely chopped. Soak fruit in water for 24 hours, then skim and discard seeds. In a small saucepan, bring kumquat water to a boil, reduce heat and simmer uncovered for 1 hour. Stir in sugar and simmer for 20 minutes, stirring frequently and skimming off foam and errant seeds. 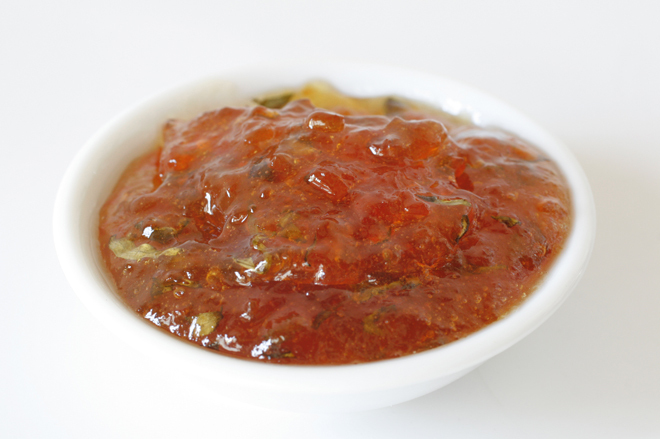 Add optional herbs to the hot marmalade, let cool and refrigerate. 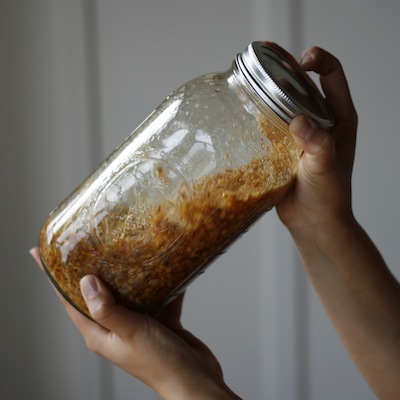 Use within a couple weeks or follow proper canning procedure if you intend to save it. “The man who sees, does, or thinks of anything else while he is making Punch may as well look for the Northwest Passage on Mutton Hill. A man can never make good punch unless he is satisfied, nay positive, that no man breathing can make better. I can and do make good Punch, because I do nothing else, and this is my way of doing it. I retire to a solitary corner with my ingredients ready sorted; they are as follows, and I mix them in the order they are here written. 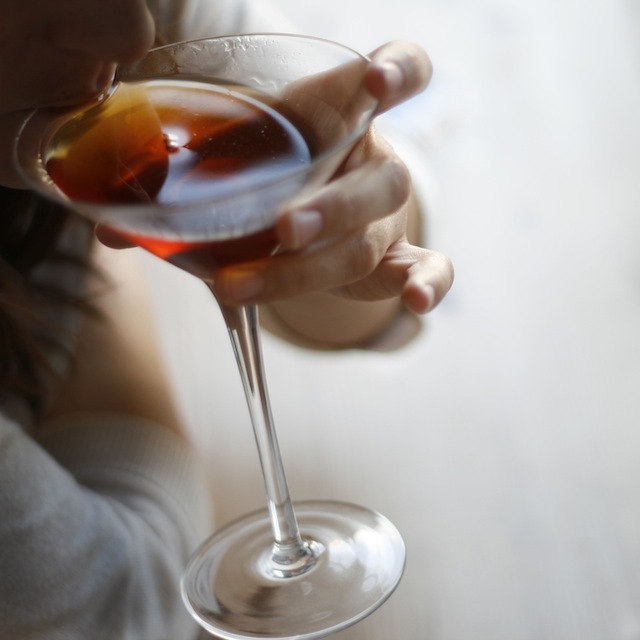 Sugar, twelve tolerable lumps; hot water, one pint; lemons, two, the juice and peel; old Jamaica rum, two gills; brandy, one gill; porter or stout, half a gill; arrack, a slight dash. I allow myself five minutes to make a bowl in the foregoing proportions, carefully stirring the mixture as I furnish the ingredients until it actually foams; and then Kangaroos! how beautiful it is!” Popular Fallacies by Charles Lamb, 1826. Note: Arrack is a pretty wide category of Asian spirits, made from coconut, sugarcane, rice or fruits, and furthermore, “arak” is a drink found in the Mediterranean and North Africa, flavored with anise, so it is hard to say what was intended in the recipe, so I tested it out with a variety of options. 1/4 ounce absinthe or coconut rum While stirring, combine all ingredients in the order listed and continue stirring until foamy.